NEW ORLEANS – In terms of quantity, there weren’t very many changes in the latest round of NCAA Division II Men’s National Team Rankings. 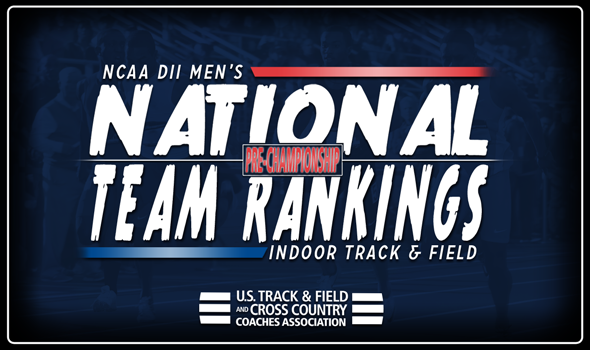 But with the 2018 NCAA Division II Indoor Track & Field Championships just right around the corner, the lone change in the top-10 could be a precursor of things to come. Colorado Mines reclaimed the top spot in the rankings, announced by the U.S. Track & Field and Cross Country Coaches Association (USTFCCCA) on Sunday, after slipping to second two weeks ago and third last week after sitting first through the first four weeks of the season. In a batch of rankings that only factors in championship participants, this climb for the Orediggers makes perfect sense, as it leads all NCAA Division II men’s programs with a whopping 17 entries into the championship meet, including eight in the distance events. The Orediggers’ distance medley relay team leads the NCAA Division II Descending Order List, and the team features an astounding six entries in the 5000 meter race. Falling two spots out of first was Adams State, which has the third-most entrants into the championship meet with 15. Looking for its first indoor title since 2015, the Grizzlies will lean heavily on its NCAA Division II-leading nine distance entrants, including Sydney Gidabuday, who leads the nation in the 5000 this season. Tiffin hopes to make it back-to-back titles this year, and it can do so with 16 entries. Placing second in the rankings, the Dragons will be led by five jumps entrants as well as super-senior James Ngandu, who is slated to compete in the 3000 and 5000. Rounding out the top-five on the week was Texas A&M-Commerce and Pittsburg State, as both squads remained in the respective places from a week ago. The Lions have 11 entries into the national meet, with an NCAA Division II-leading seven coming in sprints and hurdles events. The program also boasts the top 4×400 relay team on the Descending Order List this season. Pittsburg State is tied for sixth with 10 entries alongside Ashland, which also sits sixth in the rankings. Grand Valley State, Academy of Art, Texas A&M-Kingsville and Missouri Southern are ranked seventh through 10th, respectively. Of those four teams, GVSU leads the way with 12 entries. The NCAA Division II Indoor Track & Field Championships take place in Pittsburg, Kansas, on March 9-10. Stick with USTFCCCA for updates throughout the week leading up to the championships.